This was my first stab at reading Irving, though I was familiar with his storytelling through the excellent film adaptations of his celebrated novels The World According to Garp and The Cider House Rules. Like those works, this latest novel presents itself as an intimate epic, one that looks inwardly at an individual’s entire life amongst an eclectic community of misfits. The novel opens with a lengthy episode in the titular Twisted River community where a limping cook named Cookie and his young son, Daniel (who grows up to be a best-selling novelist) work for a logging camp. Through a series of unfortunate (and unlikely) events they become the victims of exile. What is it about logging that so fascinates novelists? Following Thomas Mullen’s The Last Town on Earth and Ron Rash’s destined to be legendary Serena, Irving’s is the third piece of popular literature I have read that obsesses over logging and the rich characters the profession engenders. These early chapters are easily the novel’s strongest, but maybe that was due to my familiarity with the milieu. Once Irving has his characters leave Twisted River, the novel loses its way, with some episodes (the ones in Iowa) far more successful than others (the ones in Boston). Due to the hit-or-miss nature of the lengthy chapters, I found it took nearly two months to trudge through these muddied waters. Through the course of the novel we are subjected to so many characters (and even the main characters suffer through self-inflicted name changes while on the run) that it’s easy to forget who is who and why they are where they are doing what they’re doing. Some of the characters, like the grizzled river driver Ketchum or the burly Six-Pack Pam come across as larger than life, too large sometimes, while others (like all the various restaurant workers) are instantly forgettable and seem to serve no other purpose than to fill pages. There are also some elements to the stories that strain credibility like an Asian restaurateur driving from Iowa to New York’s Chinatown every other week for fresh food or a sadistic sheriff who finally tracks down his prey in Canada after forty years. One has to hand it to the author, however, as he does give us the full spectrum of Daniel’s life and his evolution as a writer. But writing a novel about a writer is the oldest trick in the book, and for someone of Irving’s stature and talent, it seems a bit of a cop-out. It’s the type of thing a novelist should do early in his career to get it out their system. It used to be a favorite game of mine, and I cringe at the idea of doing it now, but then again, who am I to question the decision of a renowned, best-selling author to return to the idea late in his career? I should be so lucky to ever find myself in Irving’s position pondering the very same thing. Apparently it’s one of his common themes, along with many others that make their way through the novel including obsessions with New England, young men getting on with older women, the appeal of rugged living, male protagonists running away from “something” or “someone”, and liberal politics. Last Night in Twisted River is weighed down by self referential passages and throw-away references to the Iowa’s Writers’ Workshop, Kurt Vonnegut, and 9/11 (as seen through the eyes of a trailer park). Some of the inward glimpses into Daniel’s life as a novelist appealed to the writer in me — does learning about writing really appeal to anyone other than writers? — but they often seem out-of-place juxtaposed with the richly detailed descriptions of logging life, winters on Lake Huron and the finer details of Italian cooking. Irving’s humor could be described a bawdy-lite, and it wears thin when placed next to more serious passages about death, heartache and staring into the abyss of one’s self. The novel feels so long, by the end of it I found myself drenched with nostalgia for moments from Daniel’s younger days. 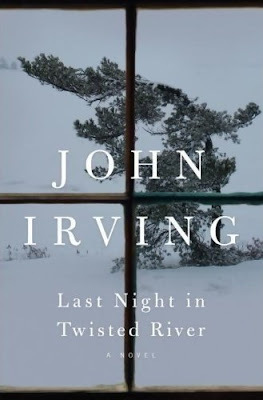 Musty, rambling, repetitive, occasionally brilliant and often pointless, Irving’s Last Night in Twisted River is like that old guy at the local bar who loves to tell tall tales. You’ll probably tell everyone about that crazy old coot (what a character!) but deep down there are some nights when you just wish he would shut up. This entry was posted in Book Reviews, Books, Literature and tagged American Authors, John Irving, Ketchum, Last Night in Twisted River, Logging, Novels, Novels about Novelists, Six-Pack Pam, Twisted River. Now that is the frankness I appreciate. And I didn’t come here to force a comment, as I did actually read THE CIDER HOUSE RULES and THE WORLD ACCORDING TO GARP, and they are fair enough efforts, not guilty of teh charges you level here, though I do suspect with this late effort you are 100% right.